WASHINGTON, DC -- While western attention is fixed on the Middle East, Russia’s aggression in eastern Ukraine grinds on. 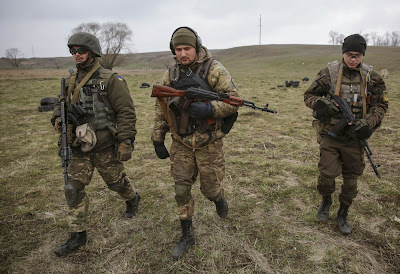 Ukrainian servicemen during a training session near the eastern city of Mariupol, Ukraine on April 1. In blatant violation of a Feb. 15 cease-fire agreement, artillery, tanks and heavy mortars fire on Ukrainian army positions on a daily basis. Since last Saturday, nine government soldiers have been killed. The West’s non-response only makes it more likely that the offensive will escalate. The cease-fire deal required Russian-backed forces to withdraw artillery, tanks and other heavy weapons from the front lines and place them under monitoring by inspectors of the Organization for Security and Cooperation in Europe (OSCE). Instead, many of those weapons are used in the daily shellings, while Russia sends still more across the border. “We continue to see disturbing elements of air defense, command and control, resupply equipment coming across a completely porous border,” NATO supreme commander Gen. Philip Breedlove said late last month. The attacks by Russian-backed forces have been concentrated in two areas: north of the city of Donetsk and its airport, and east of the Black Sea port city of Mariupol. The latter is widely regarded as the most likely target of a new Russian offensive; seizing it would allow Moscow to open a corridor to the occupied province of Crimea, which it cannot currently reach by land. Some experts believe a Russian push against Mariupol is imminent. An expert team sponsored by the Atlantic Council and the Open Society Foundation and headed by former NATO commander Wesley Clark reported last month that a Russian offensive was likely within 60 days and could come as early as next week. Mr. Clark said Moscow had deployed 9,000 troops to bolster 30,000 to 35,000 local fighters in eastern Ukraine and armed the force with 400 tanks and 700 pieces of artillery. Ukrainian forces, Mr. Clark observed, performed well against local militants but were no match for Russian units and their advanced weapons. Among other things, the government troops have no anti-armor weapon capable of stopping a Russian T-90 tank and no radios that can’t be jammed. Like a host of experts in and outside the Obama administration, Mr. Clark, a retired four-star U.S. Army general, said a U.S. decision to provide Ukraine with defensive arms might deter a Russian attack. At a minimum, he said, the United States should pre-position equipment and announce that it would be delivered immediately in the event of a new offensive. As it stands, Ukrainian forces could use the materiel now to save the lives of soldiers being picked off by incessant Russian shelling. Yet President Obama continues to overrule senior officials who support arms deliveries; like European Union leaders, he is ignoring the brazen cease-fire violations. U.S. and European officials say they will act if Russia actually attacks Mariupol. By remaining passive now, they make that offensive more likely.